Cardinal, do you accept that you have not treated the child abuse scandal in your church as seriously as you should have done. In the past yes. Er, if you mean by allegations of child abuse, I don't think they were treated as seriously as they could have been. They were treated, I think in the present situation, but we're in a different, we're at a different time. We now have the Nolan recommendations which are being implemented all over the country, and they are very important. They mean that in er, every diocese, that there's a child protection team. In every parish there's a child protection person, and indeed, in the country as a whole, there's a, there's a group that monitor, a national group, everything that's happened in a diocese in terms of child protection. But don't these latest cases demonstrate that the case of Father Michael Hill, the most notorious case, was by no means a one off. It fitted a pattern. I don't agree. I think that the case of Michael Hill in one sense was a one-off, and I can er, assert that in my former diocese that I always treated allegations of child abuse with the greatest care and the greatest attention, and did not ignore it. But in one of these case, in 1998, these new cases, in 1998 the priest was judged to be a danger to children. He was removed from parish work, and yet was allowed to continue working as, effectively a supply priest. I think that the case that you mention, and I won't want to go in to details, that priest had been er assessed very thoroughly and er, had been put, not in a parish situation, had been put in a, in a situation where in fact he was away from children and people knew, the people - authorities, of what his past was. But he was allowed to continue working as a supply priest where he could come in to contact with children. But according to the diocese, he may not have been abiding by that contract. In that case, according to the, to the Nolan recommendations, that case er, must be reviewed. If you take this other new case, is it not clear that even the guide-lines laid down as a consequence of the Nolan er recommendations, even those haven't been followed. I don't think that's true. 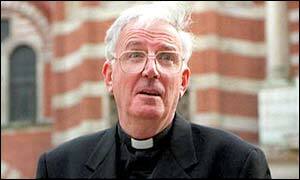 There has been a recent case which in fact, the guide-lines regarding a case in this diocese, guide lines of Nolan have been thoroughly er, er, implemented, and it's interesting that Lord Nolan himself, who has asked about this question, himself said they had been. April last year, you were contacted by a woman who e-mails you details, specific details about a former priest of yours. You reply to her by e-mail, and you do not say, Go to the police, which is what the recommendation is nowadays. You say to her, I am sure it will be wise to talk your knowledge through with some wise person, either priest or lay person. At no point in that letter do you say, Go to the police or the social services. I remember that case clearly. I said er, I wrote that yes back to the woman, but what I didn't what she didn't know is that I sent the correspondence straight to our Child Protection Team and er, er, waited, cos I remember I had no phone call, and no phone, and no phone number for her, and er, then when eventually she did contact me again, er I was, as I said extremely shocked by what she said and er, I got immediately in touch with the Sussex police and we've been in, in contact, contact - constant contact with the Sussex police, who as a result of our referral, of this case have re-opened it, er and er, and are dealing with it. In fact I understand the woman hasn't been, won't er, won't go to see them. But the fact, did I do what was right, the answer is yes. Did I take it seriously, yes. Did I follow through the Nolan recommendations, yes. Why didn't you tell her straight away to go to the police. Because er, I was waiting for her to come and see me, er, and er, because I'd written back saying, please come and see me. I wanted to know the extent of the, er, er, but I did take immediate action. And that action was to go to our Child Protection Team, and eventually, when she did contact me again, she never came to see me, I put the whole correspondence in the er, in the hands of the Sussex police. It has been said by some members of your church that many of these offences were committed in the 1980's, and that some how there was less understanding in the 1980's of the whole problem of child abuse. But surely, if it's wrong now, it was wrong then. Oh surely, it's certainly wrong, wrong now, it's wrong then, child abuse is a terrible thing. And I think before I go any further, from - what for me is the most important thing, not just about this interview but about the whole question er, is, is the hurt, and distress and pain of those who've been abused. For me, that's at the heart of what we're talking about now. Because there is a great anxiety that in the way that the church has dealt with this, it has shown itself more preoccupied with preserving or rescuing its good name than with compassion for the victims for the abuse. I think that we've been on what I call a curving line in this whole question. I think I would, I would agree that we haven't had in the past sufficient compassion er, for those who've been abused. And er, I suppose one of the reasons why I have been forthcoming very much over the last fortnight in terms of media, is precisely because I feel that I don't want to come across answering defensively, accusations or allegations, whatever, against me, because I feel that wouldn't be helpful and wouldn't help me to reflect on this far more important question of the, of the hurt and the darkness of so many of those who've been abused. What do you feel was your mistake in those cases, which you knew about. Well I, I have to say that in most cases, er, that I dealt with in my former diocese, I dealt with correctly. I never took an, an allegation of child abuse, without - uncarefully and er, and if you say did I in one or two cases make mistakes, yes I did because in fact the, the guide lines weren't there. Er, and the kind of recommendations that now come up in Nolan, weren't in place. So, er to that extent, yes, I think I was perhaps naive, perhaps ignorant. Er, but, er I always, I always took the seriously because after all I'm, I'm a priest and a bishop. Er, of course I care for priests, but I care for children. Er, I care for children very much. But in the case of Father Michael Hill, you allowed him to continue practising as a priest at Gatwick Airport, where he came in to contact with children, and continued to abuse them, for how long. With Michael Hill, I took him out of a parish after allegations made against him, sent him for therapy, and then er, eventually when he came back, er there had been expert advice, and one part of that advice was that he might be appointed, er, to an industrial chaplaincy er where there would be, er no danger er, for him with children. Gatwick Airport, as a chaplaincy was vacant, and I appointed him there and it was a great mistake. And I, I've apologised once, and I apologise again. But he continued there for several years after your own church had issued guide lines on the treatment of child abuse cases. I mean those were 1994, he was still there in 1996. I didn't know at that time any specific case any crime that he'd actually committed, but I'm not going to excuse anything with regard to myself, Michael Hill. I think I made a grave mistake and er, you know appointing him to Gatwick Airport, and I make no, no excuse for it. How many priests do you have concerns about in your former diocese or present diocese. I have, I have, well I have none. You're talking about my former diocese, I was there for twenty two years. I dealt with every allegation that came to me either by er, by going to the social services or the police, or whatever then. So there is no, and I'm quite clear about that. Is it not the case that there are files on twelve priests currently being examined by a solicitor on behalf of the church. Oh, I think that it would, with, in regard to the er, the Nolan recommendations, all all cases, we call them historic cases, er, which need as it were reviewing and looking at, will - this is not only in my former diocese, but also in every diocese. This is common practice now in the line with the Nolan recommendations that the, that files and records are looked at if necessary to see, er, whether in terms of child protection of people that anything that might or might not have happened in the past, is looked at again. Are you prepared to turn those files over to the police. If I'm asked to, to - all my files are with our child protection people, they're not here and therefore if they feel in conjunction with social services or whoever, they should, the knowledge should go to the police, no problem. I wonder Cardinal, when you look at this terrible trauma that's affecting the church, if you have reached any conclusion about why it's become such a problem for you. I think er, that it has become, the, the problem is everywhere let's be, let's be clear about that. I think that er, it's a problem in the er, in the catholic church because in line with other voluntary agencies er, we have been on that learning curve of dealing with allegations of child abuse which do come in, in every, every, every society. I think that er, I think it's particularly to be absolutely frank, it's particularly shameful and in a sense public, when any priest abuses. Er, abuse takes place as you know, most of all in families, there's no ... nothing to do with er, priests. But when a priest abuses, I do think it is very terrible and therefore public, and to that extent, I think er, the the public nature of certain cases er, does in fact cause a great deal of shock, and I think it's been a great shock, not only to the, to society, but also to the catholic church, a shock to me. And that's why I'm determined er, with my fellow bishops, to make sure that er, with the recommendations of the Nolan Committee, in every way, that we will see that any mistakes that were made in the past, will never never never happen again. Have you considered whether the obligation of celibacy may have something to do with it. I've considered it but don't agree with - don't think it has, er, and that's been asserted in ... , many times. In fact, I mean when you look at it, as I've said sadly child abuse happens more in families ever than, than in cases of the clergy, whether celibate or not celibate. And er, so I think it is not a, it is not an issue. You wrote recently about a relentless media campaign against your church and the faith of the members of your church, is that really how it feels to you. Why didn't you mention it then. Well because I feel that er, er, er I felt that the catholic church, in a sense you know, we are very er, I suppose we're very united as a catholic family, and I suppose er, when one is, when one is attacked we're all attacked, but that's a bit simplistic. I think that the, I do think that the catholic church, er in a sense has become er under attack because of the sustain(?) ... perhaps also. But I wouldn't want to stress that, in fact I'm here tonight, not to talk, obviously I talk as the arch bishop, but I, I, I'd much prefer er talk about what we're doing now, about this issue. Because we're losing sight of who the victims are in all of this. We, that's my whole point, which is the reason why I have er, as it were, left myself er, this rather late er interview because I do think that what I have to do is to listen more carefully er to the darkness and the pain and often the anger of the victims. I've already begun, I begun to do so. I do think also that there are new ways in which I can with my colleagues, introduce as it were new ways of helping victims perhaps to er, to a service, a fair service, an invitation to come and speak. There are different ways. I think there's more work to be done on that. You've conceded that you have made mistakes in the past. There are those who say that you should be prosecuted for some of those mistakes. If the Sussex police who currently have the file still open, were to attempt to bring charges through the CPS on charges of something like criminal negligence, would you resign then. I would follow the law, and co-operate with the police and Crown Prosecution in every way that the law demands. But you wouldn't consider resigning. I think my job now is to do a work. I think I have to er, as a result of this learning curve of which I've spoken, I think I have to, to help with my fellow bishops, implement Nolan, er so that we really have a climate for child protection in the whole er, in the catholic church, in England and Wales. I think I also er, have to listen to more, as I've said, er to victims. I think that er, so that anything that happens er to me, er I think er, I - the question of resigning for me doesn't arise, it really doesn't arise and I suppose to be absolutely frank, I think that my fellow bishops and er, the Catholic Community on the whole, would want me to continue to do this work, er to continue on er to deal with this most sensitive issue of Child Protection, er for the years that I remain here. Er, and that's what I will do. My - what I've considered is not resigning no, what I have considered is the ways in which I can more faithfully, more generously, er implement the whole area of protection for er, for children, and that's what I'm .... (?) of. Er, so I've not thought about myself, I've thought about the children, I've thought about how, how do we implement, how do we make that climate er of er, of child protection in every way so that in our parishes we'll have a child protection person. Er, in our communities, this becomes second nature, priority of children and their safety. This transcript has been checked against the programme as broadcast, however Newsnight can accept no responsibility for any factual inaccuracies. We will be happy to correct serious errors. "The most important thing is the hurt, distress and pain of those who have been abused"
Links to more Archive stories are at the foot of the page.